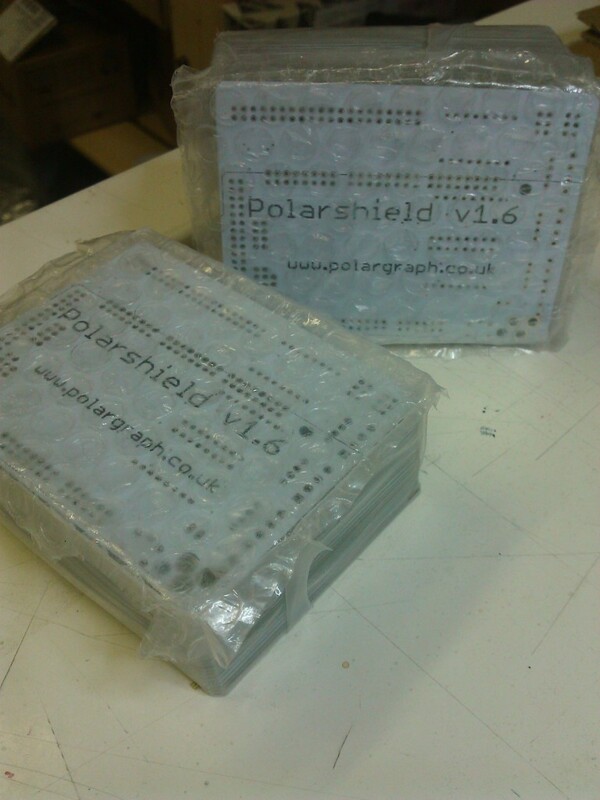 I got a good portion of the backlog moved when I got the batch of PCBs in, and PCB production is going fine. I’m waiting on LCDs though. More about that in a minute. I noticed we silently broke through the 200th Polargraph mark last month: Since September 2011 you’ve helped me move parts for over 200 drawing machines. I think that’s remarkable, and for that, I salute you, drawing warriors! In particular I would like to thank all the folks who have contributed to the forum, or written elsewhere and brought more people to the community. You know who you are. I know it’s pathetic to be waiting on parts (it’s not like it’s a surprise requirement), but I was surprised to find that the last handful of LCDs I had in stock were all cracked. Still work, but not really usable for paying customers, what. I’ve got a mega big batch of LCDs arriving soon, and they have been arriving soon, since I ordered them a fortnight ago. I’m just going to have a whinge, so I apologise in advance – everybody else I know has already heard this whinge more than once, so it comes to you, kind, gentle, compassionate reader. Long lead times is fine, and short lead times is great. Reliable lead times is best. The previous batch of LCDs I ordered astonished me by arriving 5 days later, from the other side of the world. Amazing! So, after ordering this next batch two weeks ago, I was expecting it to be here by now, but in fact I only got a tracking message about it yesterday, saying it was in Hong Kong. Oh: less amazing. The good news is that it means it’ll be here some time next week, the actual delivery is air freight, so super fast. I’m only really exposing this whinge to indicate that I share your pain and to wave a pathetic little white flag. It’s dead frustrating to have ordered something, and then not to have it a month later, when you were quoted a month as lead-time. I’m sorry about that. What I would like to impress on you is that I take this very personally, and take the necessity to provide a good service for your hard cash very personally, and in cases like this, I really feel I’m _not_ giving good service. It’s disappointing, and disheartening, and makes me sad and anxious. I’m not blaming my suppliers of course, I’m sure they have their reasons for the delay, and assume they are just as invested in keeping me happy as I am in keeping you happy. The solution for me is unsurprising, and more frustrating because of that – just add a healthy margin of error onto expected shipping dates. That’s what I’ll do in future, again. I’ve discovered that achieving consistency in a service is a much harder thing than achieving consistency with a pen, on a page. That’s something that I have a much clearer understanding of now, but it is surprising to me that having an understanding of the problems is only a very small part of providing solutions to those problems. In other news, I have a big pile of _everything else_ sitting around, looking forlorn. That is what passes for good news at this juncture. Well these took a long time, but here they are now. I’ve gone into soldering overdrive.